Experience Alta - 'The city of the Northern Lights' - one of the most northerly cities in the world. The city of Alta is the largest city in the Finnmark county of Norway and one of the most northerly cities in the world. Whilst it may look like a fairly unremarkable sort of place, rest assured that the city has a lot to offer its visitors, from museums, restaurants and historical sites to being one of the best locations across Norway from which to see the Northern Lights. Indeed, Alta is known as 'the city of the Northern Lights' and given the stable climate and minimal light pollution (particularly when heading out into the surrounding wilderness), the Aurora has been known to be seen here for up to 200 nights a year. The area is of such importance when it comes to the Northern Lights that one of the world's first Northern Lights Observatories was built here by scientist Kristian Birkeland just outside the city in 1859. Outside these magnificent natural displays, there is still much to do and see in Alta itself. The town is home to one of the most extensive areas of pre-historic rock carvings in Northern Europe dating from around 4,200 to 500 BC, which has been given the status of a UNESCO World Heritage Site. The spectacular Northern Lights Cathedral is also well worth a visit – a stunning architectural creation built in 2013 designed to mirror the appearance of the cascading waves of the Northern Lights. Outside the city, visitors can make the most of this dazzling Arctic scenery surrounding Finnmark plateau, by enjoying a range of activities such as snowmobiling and husky sledding. 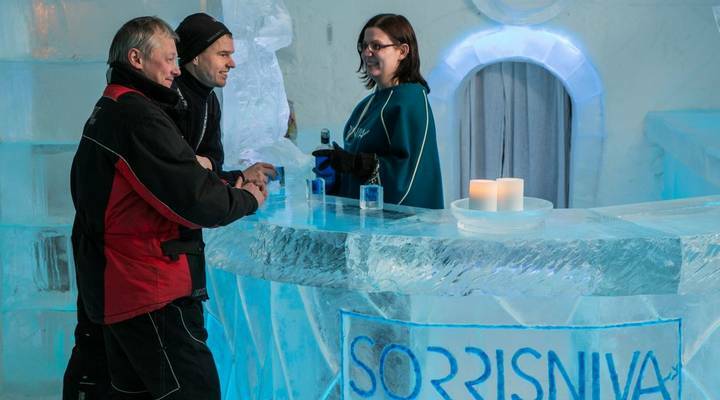 Sorrisniva Igloo Hotel is also located just 20km outside the town which showcases spectacular ice and snow designs and gives you the opportunity to spend the night in an icy cold room – an experience we are sure will be a memorable one. The population of the city is approximately 20,000, the majority of which live in the sheltered bay of the Altafjord close to the river. The waters here are rich in fishing life, so much so that the King of Norway comes here to fish each summer! Alongside fishing, slate mining is a key industry here and visitors can buy a range of slate handicrafts.